There may be pretty lights, free-flowing cocktails and a theatrical buzz at the casino, but don't go thinking that the treat for the senses is cheap. Slot players collectively walk out with as little as 90 percent of their money, on average. The odds are slightly better at the table games -- including blackjack, poker and roulette -- but there is no diversion where gamblers have the edge over the establishment. The house always wins. The odds are more favorable at a casino than state lotteries that only return as little as half of what they take in as payouts, but that still doesn't mean that a trek to Las Vegas, Atlantic City, or your nearest legal gambling institution is a rationally justifiable business decision. However, the great thing for investors is that they don't have to be on the wrong side of the wager. They can buy casino stocks to participate when the house ultimately wins. Caesars Entertainment (CZR) reported quarterly results on Tuesday, and it wasn't pretty. Revenue at its casino operations dipped slightly for the quarter as gains in Nevada weren't enough to offset declines at its non-Vegas properties. However, overnight guests helped push net revenue 3 percent higher for the quarter. 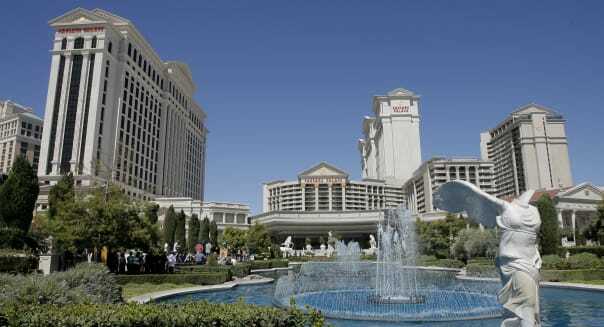 Adjusted for one-time accounting hits, Caesars delivered a narrowing quarterly deficit. Caesars closed its Golden Nugget casino in England last month, and earlier this month it completed the sale of its Bally's Las Vegas, The Cromwell, The Quad and Harrah's New Orleans in a $2.2 billion transaction. The mixed financials may not paint a very flattering portrait of Caesars, but investors can't complain since the stock has nearly tripled since going public at $9 two years ago. Casino stocks have been faring well at this stage of the economic recovery. Shares of Boyd Gaming (BYD) moved 17 percent higher on Monday after Elliott Associates revealed taking a 5 percent stake in the operator behind The Orleans on the Vegas Strip and Borgata in Atlantic City. Shares of MGM Resorts (MGM) and Wynn Resorts (WYNN) have more than doubled over the past year, and even Caesars has more than doubled off of its springtime lows last year. %VIRTUAL-article-sponsoredlinks%Investors are coming around because the gamblers are coming around -- at least as things pertain to Las Vegas. Sin City entertained a record 39.7 million visitors in 2012. It nearly matched that mark last year with 39.67 million visitors in 2013 despite having one less day on the calendar. This doesn't mean that 2013 was a flat year. There were 5.1 million delegates attending a convention in Vegas last year, and the average daily room rate increased $3 to nearly $111 in 2013. Walk into a casino and the odds dictate that you're going to walk away with less money than you had going in. Walk into one of the many casino operator stocks and recent history has served up a far more compelling risk-reward scenario.